Hoys provided the perfect camouflage for Kent free-traders. 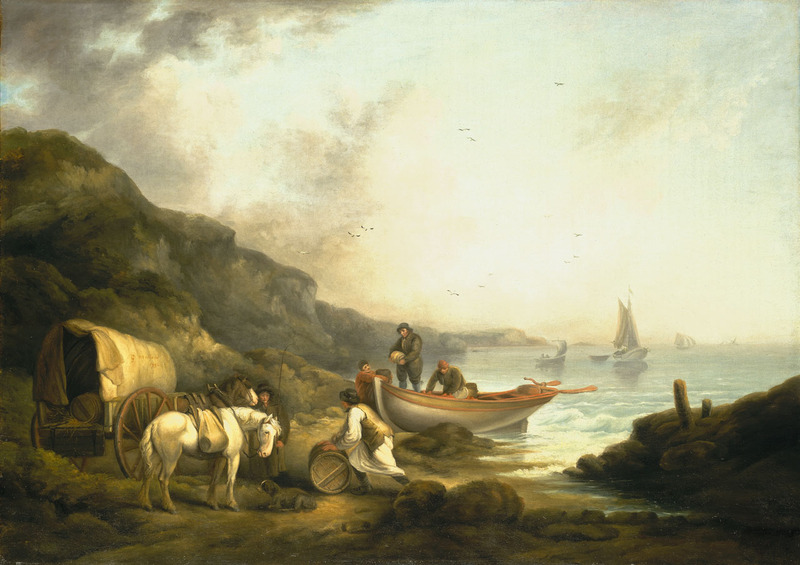 These men were not a distinct group (although smuggling gangs did operate quite openly) but were often local traders taking on an occasional special cargo to supplement their incomes. The hoymen had been a familiar sight between Dover and London and it was this that made them such a perfect cover for smuggling goods to the capital. They were part of the landscape going back centuries. From before the 17th century, Kent oats, barley and hops were transported to London in hoys or large sailing boats following a course down the Medway from Maidstone, New Hythe or Aylesford towards Rochester and then onwards up the Thames. During the 17th and 18th centuries large quantities of timber were taken from Maidstone to the Royal Dockyards at Chatham, with some of Maidstone’s leading citizens acting as major suppliers to the Royal Navy. River-borne timber was still a Kent export in the mid-19th century, while North Kent’s corn flowed out to the capital through Faversham and Sandwich. Eventually railways, better roads or, in the case of the lower Medway, industrial decline made such transport in hoys and barges redundant, but this was only after centuries during which the coastal connections had helped to shape inland economic activity. It’s been argued that Kent owed its agricultural prosperity not to the fertility of the soils which were actually very ordinary but rather its outstanding river and sea connections with London. ‘The “garden of England”, so to speak, had a sea view’ wrote Sarah Palmer on her essay, ‘Kent and the Sea’. Elsewhere we have seen how hoys were also used to transport London society to coastal towns, a more comfortable and relaxed journey than travelling on the coach roads and turnpikes. “Faversham; a fair and flourishing sea-port town, giving title to an extensive hundred in the Lathe of Scray, in the county of Kent, is situated on a navigable arm of the Swale, in a fruitfull part of the county, nine miles from Canterbury, and forty-seven from London” (Edward Jacob, 1774, A History of Faversham). Foreign trade almost disappeared, probably due to Faversham’s close proximity to London. Whatever corn or other agricultural produce found its way abroad did so only after being shipped first to London. Corn shipments from Faversham to London rose from 15,905 quarters in 1598-99 to 31,213 quarters in 1699-1700. Another feature of the port was the considerable amount of return trade with the capital. All Kentish ports depended on London to a certain extent for their trade, and it is not surprising that nearly all their produce was sent by hoy to and from London. And yet, “the extent and nature of London’s coasting trade in the 18th century must remain a matter of conjecture” (Willan 1938). The London Port Books from 1697 to 1799 were destroyed, and the single one that has survived has no record of coastwise shipments. It is only possible to reconstruct this trade by the detailed study of the outports, a piece of work that Paul Wilkinson has gone some way to researching. But the other trade that never appeared in the Port Books or Records was the free trade that the secretive hoymen kept to themselves. At Seasalter beach there is an old wreck that can be seen at low tide, resting nearly two miles out on the flats. Here, oystermen and their families lived together for part of the year, working the fields of oysters. Life on the shore must have seemed a far distant world. They were secretive and private community. The promise of a cargo of contraband was an opportunity to earn gifts in kind or a financial reward for keeping their silence and the cargo safe. So they worked with the hoymen hiding the precious cargoes from the water guard and other prying eyes. Historical Development of the Port of Faversham, Kent 1580-1780. Kent Archaeological Field School. Director; Paul Wilkinson, PhD, MIfA, FRSA.